I have learned from my lovely wife that I am not a good story teller. To illustrate this, I will use a real life example. I had a hour and a half appointment with a doctor last week to discus the plan for me. When I came home and Tiahna asked, "So, what happened?" I said, "Nothing." Then she informed me that I had just returned from a 90 minute discussion and that she wanted to hear the whole conversation from beginning to end. She has a beautiful mind where she can store zillions of hours of conversation and information. As for me, I only can remember the to do list. So in an attempt to repent and show her that I do listen to her I will give my best recollection of the past few days. Monday September 10, 2012. I needed to be in Idaho Falls by 9:30am. Luckily I have a pretty open schedule in the morning and didn't miss any classes. After a 45 minute drive I made it to the doctors office. After checking in and filling out miles of paper work that will never be looked upon by anyone for the rest of forever I met with Dr. Mcalester. If your ever in Idaho Falls and need a radiation oncologist I would highly recommend this man. He's nice, good at explaining things and answering questions, and he also has car magazines, which is always a good thing in my book. His office also has the latest and greatest in medical technology. Anyways, the conclusion was that we didn't know what was growing in me. All we knew was that I had 'pure sonoma cancer' in my right testical two years ago. The current growth is in my in is the lymph node system near my pancreas, a very common place for my previous type of cancer to spread to. These lymph nodes are connected to the lymph nodes that run to the testicals. (I'm not shy, this is another trait that my wife has talked with me about). So the thought the doc and I had was that this growth came from cells that had lingered after I had my testical removed. Well, after talking it through it was decided that I would have a biopsy, which simply means that someone would stick a needle in it and take a sample to have it tested. The biopsy was scheduled for Tuesday morning at 10, but I had to be there at 8:30 for a few more CT scans and procedures. This means that I missed my 2nd intermediate accounting class that is held at 8am. This class is supposedly one of the toughest classes in all the classes held at BYU-I, I say that considering all the chemistry classes that are provided here. Its tough because of the rapid pace that everything is taught. 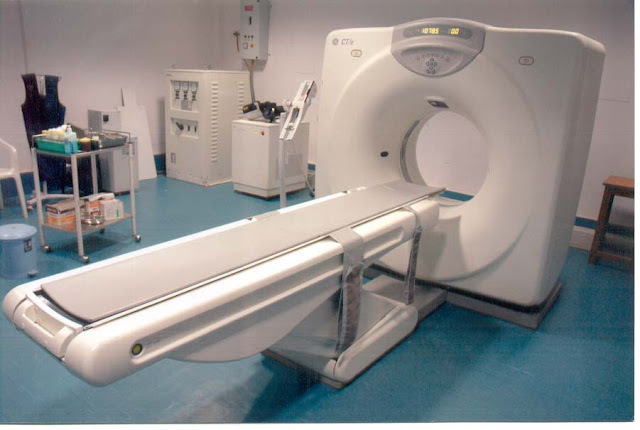 This is a CT scan machine for those who have never had the pleasure. You lay down on that plank and you go through the hole. When they slide you through it they inject an iodine mixture into your blood that gives a very warm sensation that almost makes you have to go to the lavatory. (that's my new way of saying restroom, I started calling it that after flying on a plane, lol) After I had my frirst CT scan at 9 I waited for the results. I watched Modern Marvals during my wait until a doctor came and described how the biopsy was going to take place. He told me that he was going to stick a worm like needle through my back and travel down the spine until it reaches the growth. Once at the growth it has a pincer in the head of it that injects itself into the growth and removes a sample. Sounds easy enough. Oh, and he told me that I was going to be awake through the whole thing! Thank goodness they put me on morphine and valium because that needle was not small. After our little chat they rolled me back into the CT scan room. When I got there I saw something really cool that wasn't there before. 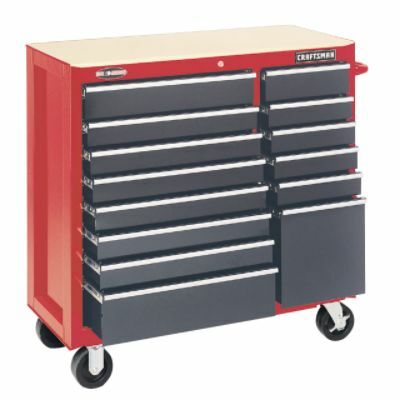 A craftsmen tool box. I thought while I was being drugged, numbed, and poked with needles, 'that is a really nice tool box, I want one of those.' Then my next memory was laying down in a recovery room waiting to be picked up by Tiahna. A teratoma is an encapsulated tumor with tissue or organ components resembling normal derivatives of all three germ layers. The tissues of a teratoma, although normal in themselves, may be quite different from surrounding tissues and may be highly disparate; teratomas have been reported to contain hair, teeth, bone and, very rarely, more complex organs such as eyes, torso, and hands, feet, or other limbs. Usually, however, a teratoma will contain no organs but rather one or more tissues normally found in organs such as the brain, thyroid, liver, and lung. Sometimes, the teratoma has within its capsule one or more fluid-filled cysts; when a large cyst occurs, there is a potential for the teratoma to produce a structure within the cyst that resembles a fetus. Because they are encapsulated, teratomas are usually benign, although several forms of malignant teratoma are known and some of these are common forms of teratoma. A mature teratoma is typically benign and found more commonly in women, while an immature teratoma is typically malignant and is more often found in men. Teratomas are thought to be present at birth (congenital), but small ones are often not discovered until much later in life. Since its not a cancer, radiation and chemo will do nothing to it. Which means that I need a doctor who is gutsy enough to take a tumor out of me that is pinned between my pancreas and two blood vessels that run next to it. And apparently no one in the state of Idaho is. Gutsy, enough that is. 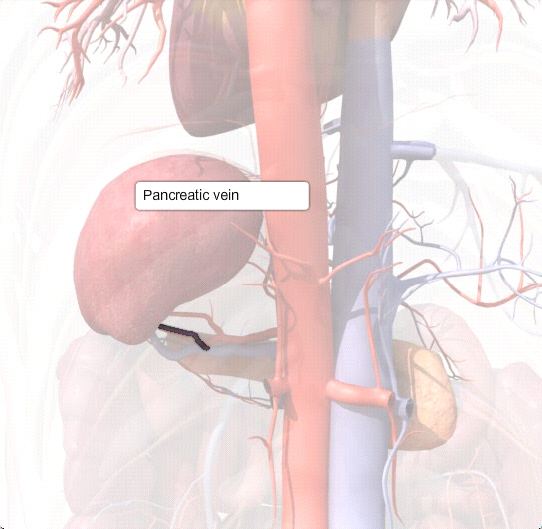 The lobe on the left is the pancreas. The tumor is between that and the red and blue veins. Since no one in the state of Idaho does this type of surgery, I will have to go to the state of Utah, and visit Huntsman Cancer Center to find the gent who will do me the honors. So this is my current situation as of 11:54 on September 13, 2012. I am glad that this is not what we originally thought. Now I don't have to worry about being infertile due to chemo and months of feeling sick. Now I can get the problem solved in one session of surgery. Thank you for all your prayers and support. I will write more after my next doctors appointment next Tuesday. Wow!! Can't believe it's not cancer!!! AWESOME!!! yeah! but tell me why they have to take it out if its been there maybe since birth and it's not malignant? We love you. I am not sure if it has been with me since birth. I would have thought that it would have been discovered earlier since I have been having ct scans since 2010. Hi Kelly and Tiahna.....such amazing news. I am with your mom Tiahna, why take it out if it's not malignant....and why the heck did they not see this while you were having treatment, scans, blood work, all that stuff? Ok, acting like a mother, sorry. Anyway, such good good news. Millie, I am laughing., your so cool, I hate him, too. And I'm with you. If it's been there forever, what is wrong with those docs? We meet with a dr here tomorrow to discuss options about the tumor, but as of now, we are not planning on taking it out till the end of the semester so he wont have to be in school when it happens. Thats the plan for now. I am actually going to take me previous scans with me to the doctors office to have them look and see if this thing was there before. we just met with a dr today, and things may or may not wait till dec at this point. We're not sure. news to come when we have more info.